Since the early 1900s, bluegrass music, a mixture of country, folk, gospel and blues, has inspired musicians throughout the world with its unique rhythms and harmonies. So, it is no surprise that bluegrass has eventually woven its way into the Wooster community. 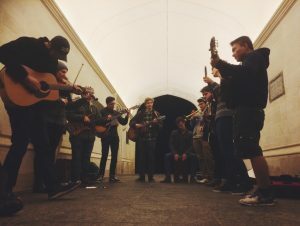 Wooster Bluegrass Jam is an unchartered group of musicians and music lovers that gather once a week, usually on Sundays at 9 p.m. at the Kauke Arch, to jam out and listen to bluegrass music. In a video about Bluegrass Jam posted to YouTube featuring Jeremy Smucker ’19, Smucker discusses the diverse songs, instruments and people involved in the group. “We play some bluegrass classics, as well as some pop folk music, and it’s open to all skill levels and any instruments,” he said. “We have a lot of unique instrumentations in Bluegrass club including some non-traditional instruments.” Included in these bluegrass instruments are guitar, voice, fiddle, mandolin, banjo and many others. One of McKain’s favorite memories from Bluegrass is how one night, when playing “Folsome Prison Blues” by Johnny Cash, as the group sang the line “I hear the train a-comin,’” a train whistle sounded from downtown. “The smiles on everyone’s faces at such serendipitous timing is forever with me,” she remarked. No matter the amount of musical experience, anyone is welcome to come out and listen or play. Generally, Bluegrass meets on Sundays at 9 p.m. in the Arch, weather permitting. Any updates on location, time and events can be found on the group’s Facebook page under “Bluegrass Jam.” Get out of those Sunday night blues and come play along!